Tactile Imaging is a way of non-invasively imaging palpable features, especially in soft tissue such as that of the breast. Wayne Westerman: Founder of FingerWorks, which has been acquired by Apple. He has also invented many multi-touch patents. 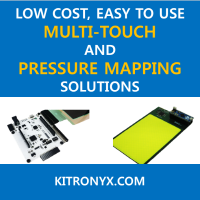 XSENSOR: XSENSOR measures pressure through its advanced pressure imaging systems, also known as pressure mapping, to offer innovative solutions. The figure below shows a pressure image when a person lies on the bed.